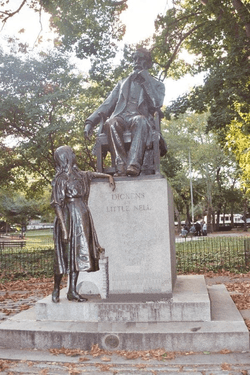 Dickens and Little Nell is a bronze sculpture by Francis Edwin Elwell that stands in Clark Park in the Spruce Hill neighborhood of Philadelphia. The sculpture depicts the 19th-century British author Charles Dickens and Nell Trent, a character from his 1840-41 novel The Old Curiosity Shop. The grouping was one of the most celebrated American sculptural works of the late 19th century, but by the early 21st century had become somewhat obscure. It is one of just two known statues of Dickens, who said he wanted no such representations. The sculpture was commissioned in 1890 by Washington Post founder Stilson Hutchins, who wanted it placed in London but subsequently backed out of the deal. Elwell, a sculptor based in New York City, completed the work anyway and had it cast by the Bureau Brothers Foundry in Philadelphia, where it won a gold medal from the Art Club of Philadelphia in 1891. The next year, he shipped it to London and put it on display in hopes of finding a buyer, but was unsuccessful, largely because Dickens’ will forbade any "monument, memorial or testimonial, whatever. I rest my claims to remembrance on my published works and to the remembrance of my friends upon their experiences of me." So Elwell shipped the work back across the Atlantic, and on to Chicago, where it won two gold medals at the World's Columbian Exposition of 1892-93. 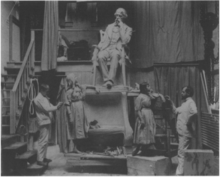 The New York Times wrote, "Among the art exhibits of this country at the World's Fair, probably no particular example has attracted more popular interest than the sculptural memorial to Charles Dickens, the work of Mr. F. Edwin Elwell, a young artist". But the work failed to find a buyer immediately, and Elwell had it sent back halfway across the country to a Philadelphia warehouse. In 1896, the Fairmount Park Art Association (now the Association for Public Art) opened negotiations to buy the work and keep it in Philadelphia, perhaps because "Dickens was twice a visitor here, in 1842 and again 1867, and garnered a following of almost rock star proportions." 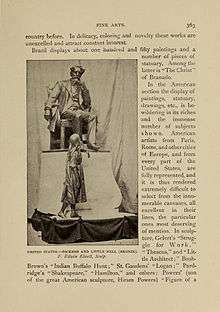 In 1900, FPAA bought the sculpture for $7,500 ($213,690 today); the following year, it was placed in Clark Park, near the intersection of South 43rd Street and Baltimore Avenue. By 1908, the association was receiving, and rebuffing, requests to move it to a more prominent place in the city. In 1911, the sculpture was mentioned in the Encyclopædia Britannica as one of the city's notable artworks. ↑ "Philadelphia Public Art: Dickens and Little Nell". Philart.net. Retrieved 2014-05-13. ↑ Malkin, Bonnie (14 March 2011). "Rare Charles Dickens statue restored to Sydney park after 40 years missing". The Telegraph. Retrieved 2011-03-14. 1 2 "Dickens and Little Nell, (sculpture)". Art Inventories Catalog. Smithsonian American Art Museum. Retrieved 2010-09-28. ↑ Annual report, Issue 42, Fairmount Park Art Association, 1908. The foundry appears to have been located at 21st Street and Allegheny Avenue, according to an 1892 advertisement. ↑ "Interactive map: Dickens and Little Nell". Retrieved 1 December 2013. ↑ "Dickens and Little Nell". The New York Times. September 17, 1893. Retrieved 2010-09-23. ↑ Carreño, Richard (February 18, 2009). "Dickens Disses Philly". Open Salon. Retrieved 2010-09-23. ↑ Annual Report, Issue 35. Philadelphia: Fairmount Park Art Association. 1901. p. 14. ↑ "Two Philadelphia Memorials". The Monumental News. 14: 117. 1902. ↑ Byers, Fran; Cynthia Roberts (Spring 2005). "Clark Park: Then and Now" (PDF). The Quest. Philadelphia: University City District (Spring 2005): 1. Retrieved 2010-09-22. ↑ Chisholm, Hugh, ed. (1911). "Philadelphia (Pennsylvania)". Encyclopædia Britannica. 21 (11th ed.). Cambridge University Press. ↑ "Dickens and Little Nell, (sculpture)". Save Outdoor Sculpture, Pennsylvania, Philadelphia survey. 1993. Retrieved August 14, 2011. Wikimedia Commons has media related to Dickens and Little Nell (Elwell).